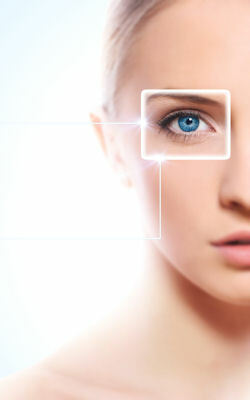 We use state-of-the-art technology including corneal topography and external digital ocular photography. We have an extensive inventory of diagnostic contacts lenses and professional resources allowing our optometrists near Silver Spring, MD to prescribe whatever best matches your individual needs. Our center can successfully manage keratoconus without surgery in many cases. We also fit specialty gas permeable, scleral lenses and specialty soft contact lenses to manage patients with severe dry eyes, corneal scarring, irregular astigmatism and corneal transplants. We have many patients who visit us from the surrounding areas of Washington, and Baltimore because of our expertise with hard to fit contact lenses. Please read the information below to learn more about keratoconus. Keratoconus is a disease where the cornea — the clear front of the eye — becomes progressively distorted. A normal cornea is spherical in shape, like a ball. Keratoconus causes the cornea to bulge forward, protruding into a cone shape. This shape distorts the rays of light passing through the cornea. The rays are unable to meet at a clear point of focus on the retina, resulting in blurry vision. Nearsightedness and astigmatism are common with keratoconus, as are glare and light sensitivity. Keratoconus patients often require prescription changes each time they visit their optometrist in Bethesda, MD especially during the progression of the disease. Often beginning in teens, keratoconus usually progresses into the 20s or 30s before stabilizing, although in severe cases it can continue to worsen. In these cases, the cornea continues to thin and bulge outward, creating even greater blurred vision. Scarring of the cornea can spontaneously develop. More than 1 in 1,800 people have keratoconus, according to researchers. In ten percent of cases, patients report a family member who has keratoconus, Risk factors for oxidative damage and weakening of the cornea include a genetic predisposition, explaining why keratoconus may affect more than one member of the same family but keratoconus has no race or gender correlation. Keratoconus is also associated with overexposure to ultraviolet rays from the sun, excessive eye rubbing, a history of poorly fit contact lenses and chronic eye irritation. Many keratoconus patients who visit Bethesda Vision Care also suffer from hayfever, eczema, and asthma. Some researchers feel that eye rubbing may increase the progression of keratoconus. Although it hasn’t been proven that eye rubbing exacerbates keratoconus, it is still a good idea to refrain from rubbing your eyes. We may prescribe eye drops to minimize eye itching symptoms. In mild cases of keratoconus, eyeglasses and soft contact lenses can provide adequate vision. But in more advanced cases, most keratoconus patients will require custom-made GP contact lenses or specialty soft or hybrid contact lenses. It’s essential to properly prescribe your custom contact lenses. This is critical not only for optimal vision, comfort, and eye health; but poor fitting lenses can increase the risk of corneal abrasions, scarring, and infection. Surgery may be necessary in severe and advanced cases; published reports say that 10-20% of keratoconus patients get corneal transplants. If an examination reveals that you have significant scarring of the cornea, your doctor may recommend a corneal transplant. In this procedure, the scarred tissue is replaced with a section of donated cornea that is clear. Although most transplants are successful, most patients afterward still need eyeglasses, soft contacts, or GP lenses for adequate vision. What Kind of Contact Lenses can Help Someone With Keratoconus? Scleral Lenses: If you are looking to wear contact lenses but have always had problems with comfort or have been told you’ll never be able to wear contact lenses because of an irregularly shaped cornea or other eye problem, it may be time to look into a type of contact lens known as a “scleral lens.” Scleral contact lenses are large diameter rigid gas permeable contact lenses designed to pass over the cornea entirely, resting comfortably on the white of your eye, also known as the sclera. This allows scleral lenses to essentially replace the irregular surface of the cornea with a perfectly formed optical surface, giving you the kind of perfectly crisp vision you may not even be able to accomplish at all with eyeglasses or other forms of vision correction. Rigid gas permeable (GP) contact lenses are most commonly prescribed. If eyeglasses or soft contact lenses cannot control keratoconus, then gas permeable (GP) contact lenses are usually the preferred treatment They provide a smooth, artificial surface to mask the “peaks and valleys” of the keratoconic cornea, in turn providing the best vision. The keratoconus center at Hartsdale Family Eyecvare uses a variety of lens designs, and the best contact lens for you will be determined following a complete evaluation. But GP contact lenses can be less comfortable to wear than soft lenses. Also, fitting contact lenses on a keratoconic cornea is challenging and time-consuming. You can expect frequent return visits to fine-tune the fit and the prescription, especially if the keratoconus continues to progress. 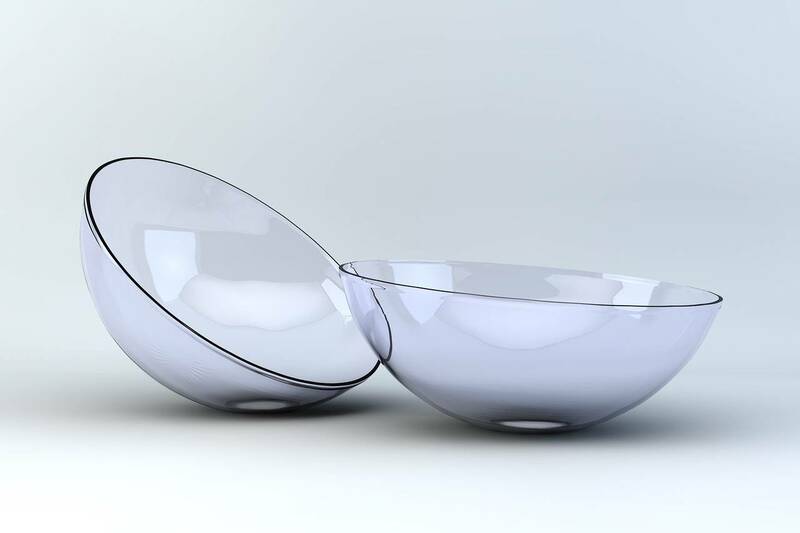 Specialty soft contact lenses: These lenses are thicker soft contact lens designs that are able to offer comfort and clear vision in many cases when regular soft contact lenses are not able to successfully correct the high degree of astigmatism associated with kerataconus and other corneal eye disease. Piggybacking” contact lenses: Because fitting a gas permeable contact lens over a cone-shaped cornea can sometimes be uncomfortable for the individual with keratoconus, some eye care practitioners advocate “piggybacking” two different types of contact lenses on the same eye. For keratoconus, this method involves placing a soft contact lens on the eye and then fitting a GP lens over the soft lens. This approach increases wearer comfort because the soft lens acts like a cushioning pad under the rigid GP lens. This is less commonly used today because of the new advances and lens designs that offer comfort and stability. Do I Need a Referral in Order to Visit Bethesda Vision Care? No. Many doctors from around the Washington and Baltimore Metropolitan Areas refer keratoconus patients to our practice, but you may contact us directly. Your first step will be a complete eye examination and evaluation. Please tell our staff that you are a keratoconus patient when scheduling your first appointment. We see many patients who are looking for a specialist in Keratoconus and hard to fit contacts in Maryland. Can I get LASIK if I Have Keratoconus? LASIK and other laser eye surgeries are not appropriate for keratoconus patients due to an unacceptable risk of a poor outcome. The LASIK procedures removals corneal tissue, and because in keratoconus patients the cornea is already thin and weak, LASIK can irreversibly destabilize the cornea and accelerate its distortion. What's new in Keratoconus Treatment? Selected keratoconus patients may be candidates for large-diameter scleral contact lenses. Scleral lenses are typically the size of a nickel to quarter. These specialty lenses rest on the white part of the eye, or sclera, and trap a fluid cushion between the cornea and contact lens, providing a smooth, artificial front surface to bend light. While scleral lenses have existed for a while, only more recent technological advances have made these designs available in clinics that routinely manage irregular corneal conditions such as keratoconus. The ClearKone hybrid contact lens, introduced by SynergEyes, Inc., in 2009, is a significant new contact lens design for keratoconus. ClearKone can demonstrably improve visual acuity and lens-wearing comfort for select keratoconus patients. In 2013, a higher oxygen permeable version of this lens, SynergEyes UltraHealth, was introduced. UltraHealth uses a soft skirt material called a silicone-hydrogel which permits greater oxygen supply to the eye. Hartsdale Kerataconus Center offers this lens treatment for selected cases of keratoconus. Our Keratoconus and Specialty Lens Center near Silver Spring, MD also prescribes special soft contact lenses for keratoconus including KeraSoft IC and Alden Lenses. These lenses are thicker-than-normal lenses which help minimize the irregular eye surface of keratoconus and results in clear comfortable vision. Specialty contact lenses are the first-line treatment of choice for keratoconus, but for some patients, surgery may be needed. A small number of keratoconus patients get corneal transplants, but this is the last resort. An alternative to transplants is Intacs® prescription inserts, also known as intrastromal corneal ring segment implantation. Intacs are generally an option when a wearer cannot tolerate GP lenses, but the keratoconus has not progressed to the point of needing a transplant. Glasses or contacts may still be needed after such a procedure; but soft contact lenses might provide acceptable vision in these circumstances, Scleral lens design is also an option when other lens choices do not offer acceptable vision. Several studies show that Intacs can improve the best spectacle-corrected visual acuity (BSCVA) of a keratoconic eye by an average of two lines on a standard eye chart. The implants also have the advantage of being removable and exchangeable. The surgical procedure takes only about 10 minutes. Intacs might delay but can’t prevent a corneal transplant if keratoconus continues to progress. Corneal Collagen Crosslinking (CXL) (corneal collagen cross-linking with riboflavin): This investigational, non-invasive procedure involves placing eye drops containing riboflavin (vitamin B2) on the cornea, which is then activated by ultraviolet (UV) light to strengthen links between the connective tissue (collagen) fibers within the cornea. Corneal collagen cross-linking using riboflavin and UV received FDA approval on April 18, 2016. CXL is a procedure that has the potential to help a great number of patients. We can now offer our keratoconus patients a proven procedure that can improve vision, and potentially eliminate the need for a corneal transplant. Corneal transplant: Some people with keratoconus can’t tolerate a rigid contact lens, or they reach the point where contact lenses or other therapies no longer provide acceptable vision. The last remedy to be considered may be a cornea transplant, also called a penetrating keratoplasty (PK or PKP). Even after a successful cornea transplant, most keratoconic patients still need glasses or contact lenses for clear vision.